This easy-to-prepare collection for SAB voices includes "Silent the Night" by Niel Lorenz and Ruth Elaine Schram, from their "Night of Wonder, Night of Joy" cantata. Incorporating portions of "The Coventry Carol" and "Silent Night," woven together beautifully by the original material, this gentle anthem will captivate singer and listener. Part-dominant Rehearsal CD is reproducible and a valuable learning aid for busy choristers and directors during the holidays. There's a new shepherd on the job in Bethlehem, but he's got a problem. He's allergic to sheep! Meanwhile, a miracle is about to happen up the street in a local stable that will change his life. The Book/CD Combination includes everything you need to prepare and present this easy, 17-minute musical. Perfect for grades K - 4, suitable for as few as 8 children, or many more. The beautiful Ugandan lullaby "Mwana Wange" is accompanied by piano and optional percussion in this tender, timeless song of the nativity adapted and arranged by Ruth Elaine Schram. It paints a touching and gentle picture of the intimacy of Mary and the Christ child. Appropriate for medium to small choirs, this piece can be used throughout the Advent and Christmas season, but is especially poignant in a Christmas Eve setting. Available in two voicings (gentle percussion included in the score), suitable for church or school use. After a brief introduction that implies glittering points of light in a midnight blue December sky, treble voices float in the upper register before the fluid accompaniment enters. This gorgeous original is an absolutely enchanting welcome to the Christ child. "Stars illuminate the midnight sky. Never has there been a night so bright; I ask why. All for a Baby, tucked in a manger, all for this tiny child ..." Equally suitable for school or church use, for mixed or ladies voices. This gorgeous arrangement of the Welsh folk song is a perfect choice for the Christmas season. Easily learned; suitable for children, youth, adults, senior adults, or ladies voices. The SSA version of this song was a number one seller and this arrangement was adapted for use in the HBO television series, "The Sopranos". Christ's birth is celebrated anew with this sensitive, expressive original anthem from Ruthie Schram for mixed voices, keyboard, with optional String Orchestra accompaniment. "Beneath the star, a common rustic barn becomes a palace worthy of a king ... Beneath the star, the darkest night is ablaze with glorious light." For Christmas Eve, use a string quintet for an even more intimate moment. Joining two respected carols into a touching tapestry of praise, this beautiful partner treatment of two loved melodies is a creative selection for the holidays. A part of the "Worship Songs Jr." series, this piece is suitable for church or school use. Optional Flute part is included in the score and adds a wistful touch. Lyrical ballad paints beautiful imagery of our Savior's birth. Incorporates "Gesu Bambino" by Pietro Yon. Optional flute obligato adds a nice touch and complements the flowing piano accompaniment. Can I Hold Baby Jesus? This tender Christmas lullaby by Ruth Elaine Schram and John Parker is also a wonderful affirmation of our faith in the Christ Child. Incorporating portions of "Away In a Manger" and "Infant Holy, Infant Lowly," this is easy to prepare yet gently moving. Flute part is included in the score and adds a perfect touch. Bethlehem court is in session with the Honorable Judge Jody Justice presiding! It's the People vs. a certain "reluctant" innkeeper ... reluctant to give a certain young couple a room for the night, that is. Sam Shepherd is the prosecuting attorney who's out to get to the bottom of this case by calling key animal witnesses to the stand. Eventually it is revealed that the greatest miracle of all happened the night before, and God can always turn things around for good! Perfect for grades K - 4, this 20 minute, easy to prepare and present musical by Mark Cabaniss and Ruth Elaine Schram, orchestrated by John DeVries, can be performed with as few as eight children or many more. The verdict is in ... "The Case of the Reluctant Innkeeper" will delight and inspire your church and community with the joyous message of Christmas! Cleverly combining two Christmas Spirituals, Chatter With the Angels and Mary Had a Baby, with the beloved carol He Is Born, the result is a darling offering to the Christ Child for children's or youth choirs. The use of optional chimes or finger cymbals creates a wonderful, shimmering effect and adds to the simplicity and charm of this anthem. Orchestrated by Tim Hayden, a delightful Accompaniment CD is also available. Give your ladies a day off this Christmas season! This bright, upbeat medley for the men in your choir includes "Go, Tell It on the Mountain," "Christ Was Born on Christmas Day," and "Good Christian Men, Rejoice." Set in a nicely laid-back 12/8 feel throughout, it will be fun for everyone involved and a delight for your congregation to enjoy during the holidays! Suitable for church or school use. Charming offering blends the beloved carol Away In a Manger with The Friendly Beasts in a delightful work for Unison or Two Part choirs. Children and adults alike will enjoy singing this arrangement by Ruthie Schram. Particularly sweet for children on Christmas Eve. An optional narration quoting scripture is the perfect lead-in to set a worshipful mood. "Hodie, Hodie, Christus natus est." The familiar "Going Home" theme from Dvorak's New World Symphony is the inspiration for this glorious setting, constructed in partner song format between male and female voices. While the women sing the traditional Latin "Today Christ is born" text, the men sing in English (an original melody), "On this day, on this day, a tiny child is born..." The optional cello part adds marvelous warmth and color to this stunning, worshipful choral. Perfect for Christmas Eve services, suitable for church or school use. Uplifting and lively, this new partner song arrangements pairs two of the most popular Christmas tunes, the traditional French carol, "He Is Born," with the traditional Spiritual, "Go Tell It On the Mountain." Crowned by an optional flute solo, equally suitable for church or school use or any Christmas celebration. Give your ladies a day off in December! Ruthie Schram has created a wonderful holiday selection for Two Part male chorus. (Also available in a mixed setting.) During the telling of this classic carol about a king who is generous to the poor during a harsh winter, she mixes the use of soloists and word painting to help the audience experience the cold winds and the conversations between the good king and his loyal page. This piece is easily learned and could be a useful tool in attracting young men to become involved in your church choral program. Erik Satie's elegant "Gymnopedie No. 1" is the basis for this haunting Christmas work. The text by Ruth Elaine Schram matches the thoughtful, lyrical music. First, we invite the precious baby to "rest, now, rest as the angels sing 'lullay, lullay, dear baby'..." But as the end of the second verse approaches, we foreshadow that "one day there will be no angels that sing; instead of a manger, a cross for the King... so rest, now rest..." In two voicings; optional flute part included in the score. This lovely Ruth Elaine Schram setting of the French carol exudes the beauty of the Christmas season. Sensibly and accessibly scored for Two-part voices, piano and optional flute (included), the natural joy of the text will come shining through. At Christmastime, we are reminded of the tender care of a young mother over her tiny Child, and this lyric anthem so beautifully captures those quiet moments in a humble stable. Liquid vocals, piano and flute obligato (included in score) outline a new melody along with the beloved carol Once in Royal David's City in this anthem that adds a touch of wonder to your December worship service. Rehearsal CD is available to assist your choir in learning this piece. "Hush, Little Baby" is a beautiful Christmas lullaby by Gene Grier and Ruth Elaine Schram suitable for use any time during the Christmas season but particularly meaningful for Christmas Eve services. The verses of the song are sung directly to the Christ-child, while the chorus is more general and directed to the listener. The events of Jesus' birth are depicted lyrically and musically, and the last four measures incorporate the phrase "Sleep in heavenly peace" from the beloved carol "Silent Night, Holy Night," giving this song a gorgeous, poignant ending that will linger in the minds and hearts of your church. A beautifully harmonic setting of the popular carol with long, flowing lines, this will appeal to every church choir capable of singing three-part divisi for both women and men. The skillfully written keyboard accompaniment and flute obbligato provide marvelous support and tonal color throughout. Chord symbols are provided to add string synthesizer to complete the effect. Beautiful! Unique partner song for S(S)ATB choirs begins with the popular French carol set in a tender, deliberate tempo. The men begin the song, setting the stage for the angelic entrance of ladies voices singing "Gloria in Excelsis!" from Ruth Elaine Schram's original "He Is Born, Gloria!" English subtext is included with the traditional French for flexibility in programming this during the holidays. Remember what it was like to be a child and have your imagination run wild; to imagine all of the wonderful places you could go and all of the exciting things you could see? Well, geeky scientist, Adam Angel, is a dreamer, and with just that kind of imagination, every single day he dreams of adventure and fame, fancying himself as everything from an archaeologist to a race car driver. He has lost the true meaning of Christmas, and doesn't find it until he dreams of being the angel that announces the birth of Jesus! This delightful children's musical, from creators Mark Cabaniss and Ruthie Schram, will take you on Adam's journey as he becomes that angel. It is filled with wonderful new music and traditional carols. The message is clear, during the Christmas season and all through the year, we are ALL incredible in God's eyes! Easily prepared and presented, this 19-minute reproducible musical will take your young singers (and your congregation) on a unique and entertaining trip to the heart of Christmas. Perfectly suited for grades K - 4. Ruth Elaine Schram has created a gorgeous melding of the beloved carols "Infant Holy, Infant Lowly" and "Silent Night" in a gentle arrangement that is equally suited for both church and school use. A gentle, worshipful contrast, it will bring moments of beauty and reflection to any seasonal worship service. Available for SATB, SSA, or Two-part Choirs. Welcome the Child of Christmas with this light, lyrical anthem, reminding us that every miracle that surrounded the birth of Christ was as much for us as it was for the people of that day. "Celestial glory, the star so bright, the old, old story, the silent night, the sweet Redeemer Child who would change the world; it was all for me..."
This original Christmas anthem has both a Flute (or Violin) and Cello obligato (included in score) and incorporates the refrain of the familiar carol, "O Come, All Ye Faithful." With a celebratory piano accompaniment that has both life and energy, this arrangement will be one your ensemble truly enjoys. Accompaniment CD available. Lively Christmas anthem by David Davenport and Ruth Elaine Schram, depicting the joy, hope and love brought to the world by the arrival of the Christ-child. The baby Jesus is born in the last place on earth you'd expect to find God's son - behind the last stable door on the left at the Last Resort Inn! This delightful Christmas story is told from the animals' point of view. All of the animal characters - Donkey Jody, Cowsandra and Cowdy, Shiloh and Woolian Sheep and Camel Lot soon realize that despite their humble status, God has a very special place for them in Bethlehem at the Last Resort Inn! 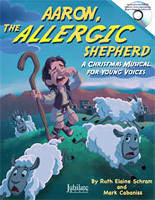 Suitable for Grades K-6, perfect for Sunday School programs or as a Church School Christmas musical. Approximately 20 minutes in length; easy to prepare with familiar melodies. Delightfully orchestrated by Tim Hayden. Unique Christmas song, capturing the naivete of gentle, simple lambs who recognize the voice of God in a baby's cry; who see not an infant, but their creator lying in the manger. Portions of "Away in a Manger" are woven throughout to enhance the innocence of this child-like faith. The lines sung by "the lambs" are designed to be performed by a children's choir, but would also be effective sung by a small ensemble, child or adult soloist, or a few sopranos. This beautifully and skillfully blended medley of "O Holy Night," "Silent Night," and "All Through the Night" will stir hearts and minds, back to the night when the angels sang and peace was promised to our world. Lush choral harmonies are supported by a lyrical piano accompaniment. Suitable for church (especially meaningful for Christmas Eve) or school use. The quiet simplicity of Christ's birth is delicately captured in this tender original anthem and rich Herb Frombach text, beautifully set to music by Ruth Elaine Schram, and enhanced by the optional flute part (included in score). An accompaniment CD is also available. This gorgeous melding of two beloved carol tunes, "Lullay My Liking" and "The Coventry Carol," features an original text and provides a beautiful and worshipful Christmas lullaby for treble or ladies voices. Artful dynamics rise and fall with the melodic lines, then crescendo to a joyful alleluia. The cello obbligato truly enhances this stunning setting. Available for Two Part or SSA voices; Accompaniment CD available. Suitable for church or school use. This anthem also appears in the SSA collection Six Anthems for Women's Voices and would make a lovely trio or small ensemble piece. A gentle pairing of two beloved Christmas carols, the Polish carol "Infant Holy, Infant Lowly" and the English "Coventry Carol." Together they create a lovely lullaby setting for the celebration of the birth of the Christ Child. This gentle piece will set up a moment of quiet reflection and introspection in your Worship Service during the Christmas season. Suitable for Youth Choirs or Children's Choirs (or Adult Choirs) in mixed and treble settings. May We Enter the Stable? Lovely song by Gene Grier, arranged by Ruth Elaine Schram for mixed voices. Incorporates the traditional "Polish Lullaby" (words translated by George Evans) and has optional flute part included in the score. Welcome to Bethlehem and the Christmas Cafe, where Polly Porkchop and Mac N. Cheese serve up some home cooking and tell "The Greatest Story Ever Told" that happened right up the street not long ago! Easily prepared and presented, this funny and touching reproducible musical by Mark Cabaniss and Ruth Elaine Schram can be performed by large and small children's choirs alike. Orchestrated by John DeVries; presentation time approximately 20 minutes. Watch the Digital Reading Session with Ruth Elaine Schram and Mark Cabaniss here! More Than a Baby New! This contemporary ballad is stunning! Written from the perspective of someone looking into the manger, the children will declare that they see more than a Baby - they see the Savior of the world! The melody is memorable and easy to learn. Sure to be a favorite! Dedicated to Ruthie's two daughters when they each became a new mother, this tuneful anthem has a dual text for family celebrations (especially appropriate for Mother's Day) and Christmas. The imagery of a loving mother's hands wiping away a tear, preparing meals, and folding in prayer, lead to the climactic chorus based on Proverbs 31: "...And we will rise up and call her blessed! She is the hand of God in a cold, dark world, and we honor her..." The alternate Christmas text focuses on Mary and how she was an exemplary, godly mother. Available in two voicings. This lively anthem by David Davenport and Ruth Elaine Schram will send spirits dancing and set toes to tapping! There is urgency in the melody and this holiday anthem is filled with happy reminders of the joy of Christmas and the miracle and wonder of this season of praise. Some divisi in the ladies part provides lush fullness in the middle section. Don't miss this one! In this beautiful choral lullaby for ladies voices, Debussy's gorgeous "Reverie" is artfully woven with the Welsh lullaby "All Through the Night." Your singers will grow musically while learning this dreamy selection which will add an unforgettable moment to your Christmas Worship. "Sleep, dear baby, sleep all through the night..." Suitable for church or school use, perfect for Christmas Eve. Classical Masterworks with Christmas Carols arranged by Ruth Elaine Schram, beautifully orchestrated by John Purifoy. This artful blending of classical masterworks with beloved carols creates a unique collection you will use time and again. The five arrangements contained in this collection are useful throughout the Advent and Christmas season. You may use the selections individually or present them together with the optional narration included in the book for a rich 25-30 minute cantata. Because the pieces are based on well-known classical works, the introductions tend to be longer than usual, allowing time to add your own dramatic presentation if you desire. Ruth Elaine Schram has a true gift for writing for the needs of today's choirs, and this Christmas choral, which combines original material with two familiar tunes, "O Come, Little Children" and "O Come, All Ye Faithful," is no exception! The setting is just the perfect fit for adult and children's voices, with very nice exchange of melody between them. The solid accompaniment supports the lovely melody while the text summons us all to come to the Christ child. It makes a great opener for both worship services and school programs. An optional string synthesizer part is included in the score, adding just the right touch. A beautiful orchestration by Ruthie's brother, John G. Gage is now available, making this a perfect opener for a Christmas Pageant or your Winter Concert in schools with band and orchestra programs. The beautiful, legato, 13th century plainsong melody arranged by Ruth Elaine Schram may be performed accompanied or a cappella. There is no meter signature for this chant-like work; this among many other elements are opportunities for developing expression and phrasing. This song incorporates "The Coventry Carol" which works in partnership with original words and music to depict the arrival of God's Son to earth on that holy night. Set in gentle 3/4 time as two part any combination, it may be sung by children's voices, mixed adult voices, senior adults, or youth ensembles. 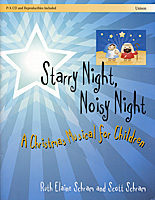 A delightful Christmas musical for children by John Jacobson and Ruth Elaine Schram. Tells the story of the Savior's birth from the stars' point of view! This fast-paced, energetic and joyful pairing of "Pat-a-Pan" and "Sing We Now of Christmas" is enhanced by both flute and percussion. Available in five voicings to meet the needs of most any ensemble, this dynamic arrangement will create a high point in your holiday worship service or Christmas Pageant. Parts for Hand Drum and Flute are included in score. This beautiful anthem is based on the well-known Christmas carol "Stille Nacht," but set in 4/4 rather than the traditional 3/4, giving the melody a more relaxed feel. An original second melody (and text) works alone or as a lower descant or counter-melody. The lush keyboard part may also be used as a piano solo during the holidays. This arrangement of a lovely French carol may be performed in French or English. With canonic-like imitation throughout, this is a sensitive, haunting, beautiful carol, wonderful for seasonal worship. Flexibly voiced for Two-part Mixed / Optional 3-part Mixed voices (Alto part is optional throughout) with piano accompaniment, this is perfect for small church choral programs, youth choirs, or larger church choirs with minimal rehearsal time. A lovely new text by Ruth Elaine Schram is beautifully set to the classic Englebert Humperdinck melody from "Hansel and Gretel." The string orchestration option (Violin 1 and 2, Viola, Cello, and Double Bass; available digitally from Hal Leonard online) makes for a stunning accompaniment with live players or with the recorded track. Church musicians are expected to be flexible, and Ruth Elaine Schram is making that easier than ever in her continuing "Prayludes" series. A "praylude" is a medley of popular hymns, designed to be playable in several lengths, with optional start and stop points throughout. Easy to prepare but musically satisfying and creative, these nine medleys will take you through Advent, Christmas, and Epiphany, to the beginning of a New Year. Prayerful song depicting the birth of our promised redeemer. Word pictures paint the scene, which crescendos into the chorus: "Who would have thought that this was the way the Father would send His Son? But on this blessed day, we see Him, we hear Him, we touch the Promised One." This could quite possibly be the definitive Christmas Musical for young children! Straight from the Luke 2 passage of the Bible, The REAL Christmas Story becomes the script for this adorable preschool musical, created by Ruth Elaine Schram. Due to an unannounced snowstorm, the grandchildren and their parents are unable to fly to Florida to be with their grandparents for Christmas. With the capability to visit via video chats, the grandparents carry on the family tradition of reading the Christmas story of the birth of Jesus to the grandchildren on Christmas Eve. As each scene of "the Story" of peace, joy, hope and love is read, the children respond with five wonderful songs that are perfectly designed for preschoolers, both in content and musicality. Familiar carols and original songs are upbeat, fun, beautiful and sincere in this 15-minute presentation. Whether presented with the contemporary script of this musical, or with your traditional nativity enactment, these songs and music are sure to be a resource to be used year after year. Festive Partner-song arrangement of the Swedish carol "Yuletide is Here Again" and the Danish carol "A Child is Born in Bethlehem" is a nice, joyful change of pace for your young singers during the Christmas season. Set in bright triple meter, the two songs are introduced individually then combine effortlessly to celebrate the birth of the Savior. This original, rhythmic, upbeat Spiritual by Ruth Elaine Schram will be a change of pace for your Christmas program! "See Him in the manger, time for joy! Heaven's love has given us a baby boy. See Him in the manger, time for praise! Finally, a Savior after all these days..."
With gentleness and a sense of awe, this expressive original anthem by Ruth Elaine Schram and her daughter and son-in-law, Celsie and Robert Staggers, tenderly cradles a picturesque text with exquisite tuneful beauty. A contrasting middle section challenges all to hurry and behold the Savior, then the quietness of the manger returns with a quote from the familiar "O come, let us adore Him." An optional flute obligato (included in the score) adds a lovely shimmer. Originally included in the collection Noel Masterworks, this lovely arrangement of "Silent Night" features strains of Debussy's Clair de Lune in the accompaniment. With a tender and exquisite orchestration by John Purifoy, this much-loved and familiar carol is offered to us in a heartfelt and stunning new light. This upbeat Christmas spiritual is just plain fun to sing! The very accessible syncopated rhythms fit the text perfectly. Voiced for SATB choir (with some optional divisii) and soloist. Whether sung a cappella or with the piano accompaniment, this choral is sure to add energy and joy to your seasonal programming. This joyful medley combines two carol favorites, "Sing We Now of Christmas" and "The First Noel," flexibly arranged for Unison or Two Part voices of all ages. A great choice for children's choirs on Christmas Eve, or for a quickly prepared adult anthem for the busy holidays or the Sunday after Christmas. Optional flute, triangle, and snare drum parts (included in score) add the crowning touch for Christmas worship or concerts! A CD track is also available. 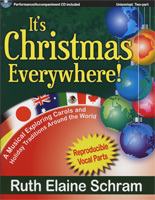 This fun, upbeat pairing of two African folk songs (from Ruthie's collection, "It's Christmas Everywhere") is a dynamite choice for your choir of any age during the Christmas holidays. Two sets of lyrics are included, making this perfectly suitable for church or school use. Employing a variety of percussion adds to the fun, and specific suggestions and ideas for use are provided. For mixed or treble voices; delightful accompaniment CD orchestrated by Greg Gilpin. Three-part Mixed / SAB version works with E - C range or F - D range for guys. Compiled by Jean Anne Shafferman, this collection of Seasonal songs for Two Equal voices includes Ruthie Schram's beautiful arrangement of "A La Nanita Nana." These flexible duets are a great resource for holiday concert or Advent / Christmas worship. Both parts are scored in the treble clef and can be performed by unchanged treble voices, women's voices, men's voices, or mixed voices. Book includes mixed media CD. Based upon a relatively unknown carol by John B. Dykes, this lovely arrangement incorporates portions of the beloved "Still, Still, Still," which is always a favorite at Christmas time. This sensitive and accessible setting by Ruth Elaine Schram with its unexpected chord structure will be warmly received in either a church or school setting, and is perfectly suitable for a Christmas Eve service or Winter Concert. With limited range SATB voicing (perfect for smaller choirs or choirs with limited range abilities), Sleep Holy Babe is accompanied by piano with optional flute and glockenspiel. Lovely, gentle lullaby to the Christ-child, as sung by Mary and Joseph to her new-born Son. "Sleep, precious child of mine, sleep, holy child divine; all too soon you will be grown, so while you're ours alone, we worship you, our Savior and our Son..."
Beautiful Christmas lullaby by Gene Grier and Ruth Elaine Schram incorporates "Silent Night" by Josef Mohr and Franz Gruber. Optional flute or C-instrument part is included in the score. "There is a rose, a perfect rose, the prize of heaven's garden; sent down to earth as a tiny Child, to secure our pardon..." This expressive, gentle lullaby is filled with the wonder of Christmas and briefly quotes "Lo, How a Rose E'er Blooming." Lyric vocal and accompaniment lines create an atmosphere of love and worship to the Perfect Rose. A fine choice for any December service; particularly effective on Christmas Eve. 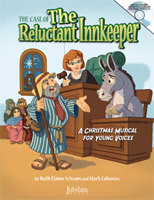 This Christmas musical is perfect for children's choirs, Christian schools or Sunday schools. Throughout time, the touch of an angel has changed people, events and even the course of history. In the Christmas story, God used angels to change the lives of ordinary people with extraordinary news, extraordinary missions and extraordinary blessings. All of these people - Zechariah, Elizabeth, Joseph, Mary, the shepherds and the magi - were changed forever by the touch of an angel. Turn back the clock and witness the exciting events leading up to the birth of Christ in this Christmas Musical for children. Gorgeous word painting sets the mood for the first Christmas night: "underneath starry skies, shepherds are watching their flocks by night, angels are singing as they are taking flight, and all are invited to greet the new baby in a stable in Bethlehem." Tenderly tucked in the middle of this piece is the traditional Welsh carol All Through the Night, giving the listener a taste of the familiar within this stunning original. An elegant piano accompaniment supports this memorable piece which is equally suitable for church or school settings and voiced for mixed or treble ensembles. A Christmas musical for children K-6 by Ruth Elaine Schram and Scott Schram. Beautiful, uplifting work for Christmas based on Isaiah 9:6. "Unto us, a Son is given; unto us, a Child is born. Unto us, a touch of heaven has appeared in human form ... Unto us, Jesus! Unto us, the Son of God!" Suitable for any size choir with supportive piano accompaniment. An arrangement of rare beauty! Adeste Fideles and Gesu Bambino are woven together seamlessly, resulting in a stunning choral that is truly greater than the sum of its parts. There is some Latin, but most of the text is English, and the accompaniment with optional flute part (included in score) contributes its own voice as it supports the glorious sound of the voices. Church choirs everywhere will be performing this for years to come! This gem is an optimal anthem for Epiphany. Often observed on a Sunday when choir numbers are low or rehearsal options are limited, this partner song works splendidly for choirs small and large. After its introduction, the new and original song is partnered with the familiar "We Three Kings of Orient Are." Flexible, practical and inspirational. Were You There in Bethlehem? This expressive anthem suitable any time during the Christmas season incorporates portions of the beloved spiritual, "Were You There?" woven with original words and music. Poetic imagery gently paints the scene, building up to the dramatic chorus: "...If I had been there in Bethlehem, with heart full of wonder, I would have welcomed Him; If I had seen Him, touched Him, held Him..." Optional flute part included in the score adds to the beauty of this piece. Highly effective for Christmas Eve services. Accompaniment track is available. The gorgeous Irish carol has been paired with the familiar "Venite adoremus Dominum" chorus from "The Snow Lay on the Ground" to create a lovely Christmas offering for treble voices. Optional flute and cello parts add a crowning touch to this exquisite selection that is suitable for church and school settings. Ruth Elaine Schram unexpectedly incorporates the familiar (and usually non-seasonal) hymn "Fairest Lord Jesus" by Schlesische Volkslieder and Joseph A. Seiss into this lovely anthem suitable for Christmas Eve, Christmastide, or any time during the Christmas season. Your choir can make use of the full range of dynamics in order to emphasize the power of the message; the song begins at mp, swells to f, and ends softly, gently, contemplatively. Voiced flexibly for two part with optional harmony to the original melody; perfect for treble voices, mixed voices, senior adults, ladies choirs, or any age and combination. This delightful piece by Ruthie Schram lifts aspirations for a special Christmas moment for young voices with her precious song which partners "Silent Night" with an enchanting new original work. A wonderful teaching piece for choirs beginning to learn part-singing, yet eloquent enough to captivate choirs capable of harmony. This gorgeous setting of the beloved carol is set for SSA voices. By featuring two clarinets, Ruthie has created a hauntingly beautiful and unique Middle Eastern aura. Optional lyrics are included to make it equally suitable for school use as well. Versatile arrangement incorporating "What Child is This?" (words by William C. Dix; 16th century English melody) arranged for two part voices with optional third part, suitable for mixed choirs, children's voices, ladies voices, or senior adults. 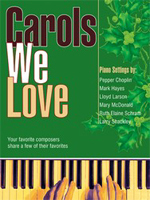 Original words and music by Ruth Elaine Schram work in partnership with the well-loved carol. Perfect for Christmas or Epiphany. Lovely anthem depicting the miracles on the night Christ was born. "...On the night of Jesus' birth, when the Savior came to earth, humankind was shown its worth in a new and glorious light..."
Give your men a Sunday off during the busy holidays, or give your ladies an extra special moment in the worship service! This gentle Ruth Elaine Schram setting of a lovely Kenyan folk song is an opportunity to give your ladies a chance to tenderly tell the story of the Christ child in the manger. "...Star shine falling, brighter than day; shepherds calling, joyful are they. Tucked among the cattle and sheep, no wonder baby won't sleep!" Suitable for church or school use.